and he might as well be Groucho." CAPTURING THE SUBTLE TRUTH OF GROUCHO'S VOICE." 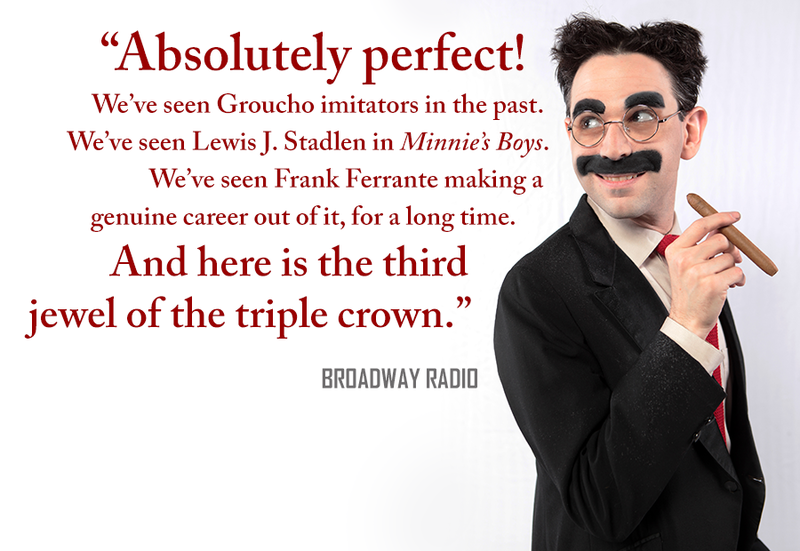 I have a long history of playing my hero, Groucho Marx, both on and off the stage. In addition to countless variety and cabaret appearances, I have donned the tails and greasepaint in productions of Animal Crackers, Groucho on the Air, Music of the Marx Brothers, and especially I'll Say She Is, the first-ever revival of the Marx Brothers' long-lost 1924 masterpiece. Slideshow: Photos by Mark X. Hopkins, Jim R. Moore, and Amanda Sisk. ". . . And then the research, the endless hours of delicious, meticulous detective work, with no particular goal other than to learn everything possible, to know something inside and out, to possess it. I started, of course, with Adamson. I read it cover to cover, over and over, and I gradually surrounded it with two entire shelves of books and articles by and about the Marx Brothers. I stayed at the library until closing time, squinting at microfiche, poring over film and theatre reviews from the twenties and thirties. I carried home with me, again and again, Why a Duck?, Harpo Speaks, The Marx Brothers: Their World of Comedy. "Watching and reading about the Marx Brothers could only take me so far. The obvious thing was to be the Marx Brothers. Inevitably, I identified with, and as, Groucho. I would lock myself in the bathroom and give myself the moustache and eyebrows with my mother’s eyebrow pencil. Shayna and Joey were long accustomed to compulsory service as my stock company, obliging me through epic living room productions of 1776 and Fiddler on the Roof. That they were now asked to don wigs and hats or speak in vaguely Italian accents or honk bulb horns was taken easily in stride. We were the Marx Brothers for years, at parties, in parades, in talent shows, and just around the house in our spare time. "Out in the cruel world—which is to say, at school—Rufus T. Firefly was less welcome. I told some poor girl that her eyes shined like the pants of a blue serge suit. 'That’s no reflection on you,' I added, wiggling my eyebrows. 'That’s on the pants.' She didn’t know what a blue serge suit was, and neither did I, and that was just the beginning of our problems." With my sister, Shayna (as Chico) and my brother, Joe (as Harpo), waving to onlookers at the Boom Box Parade, Willimantic, Connecticut, July 4, 1989. Background photo: With Brian Hoffman (Harpo) and Corey Moosa (Chico) on stage at the Opus Playhouse, Coral Springs, Florida, 1991. The Jewish Museum's Wish You Were Here program celebrates Andy Warhol's portraits of noteworthy Jewish figures of the twentieth century. In 2015, the Museum invited me to appear as Groucho Marx for ninety unscripted minutes, in conversation with Jens Hoffmann. "Let us pause to consider the persistence of Groucho Marx. Only yesterday, I read a piece by the Chicago Tribune columnist Heidi Stevens, in which she noted that her kids considered some of her favorite films from the '80s and '90s -- Back to the Future, Big, and A League of Their Own among others -- to be hopelessly antediluvian in their attitudes. I have no doubt that she is correct -- and yet, there I was, at the Connelly Theatre, seeing a revival of Marx Brothers bauble from 1924, with an audience that had a significant complement of pre-adolescents, and Noah Diamond, the actor playing Groucho, was slaying -- with the loudest laughter coming from the kids in the house. The young man on my right, who looked to be about eleven, was enjoying himself mightily. That Diamond scored by impersonating a performer whose heydays -- on Broadway and in movies of the '20s and '30s and as a game show host in the '50s -- are as good as eons away for audience members better acquainted with the Disney Channel is, in my opinion, nothing less than remarkable. "Then again, why not? I've seen several Groucho impersonators in my time and Diamond is one of the best. With the application of the eyebrows, the glasses, and the greasepaint mustache, he's a dead ringer for Groucho, and he has captured that reedy, insinuating voice that levels logic and blows solemnity to smithereens. He dashes around the stage in that familiar dropping-camel walk, relentlessly delivering one-liners like one of those automated pitching machines in a batter's cage. "Diamond is fast on his feet and has mastered the art of the Marxian ad lib: At the performance I attended, the curtain failed to fully part for the opening scene, causing some frantic stagehands to pull it back and drape it. A couple of minutes later, Diamond entered and, looking right at us, said, 'The tickets cost thirty dollars. You didn't expect the curtain to open all the way, did you?'" "The original Groucho was, above all, an outsider. What he really wanted to be was not a comedian but a writer, poor guy (Richard Avedon said once that his portrait of the older Groucho was the most perfect study of a Jewish intellectual he had ever made), and his complete freedom from love me/need me, the performer’s curse, is what makes his performances still so astonishingly fresh. He breaks through the fourth wall, of proscenium illusion, but, even more importantly, he breaks through the fifth wall, of the performer’s desire to be loved. There is a hair-raising photograph of the four Marxes in their youth (reproduced in a book that Diamond wrote about his quest, 'Gimme A Thrill') that shows them hungry and beautiful and looking exactly like either an anarchist cell or a gathering of Futurist painters, or maybe both. That ravenous energy is irreproducible. Now Groucho onstage seems lovable, not because Diamond softens his edges but because the past is invariably softened and smoothed by the ocean-wash of time. Groucho’s leer was once pure lust—now it is lust plus time, and lust plus time is longing. "Noah Diamond knows this. What occurs in his revival—no matter how diamond-hard the action or exquisitely achieved the comedy, no matter how charmingly retro-right the music and dance—is the intrusion of filial piety. 'We love the Marx Brothers, love them sentimentally, emotionally, with all our hearts,' Diamond has said, and that love, which of course the brothers could not feel for themselves, fills the space. What will survive of us is love, Philip Larkin once wrote, and in a weird, unsentimental way, this is necessarily true: only a steady infusion of softness can keep alive even the most hard-edged of forms, and the softness of retrospective love blurs comedy’s boundaries even as it reproduces its shapes. Yet, if the laughter is touched with longing, it is still laughter, and it is still loud. For the moment, Diamond and Sisk can look on, proud and astonished parents, at the most Marxian of sights: an audience in New York, grouching with joy." Found Its Way Back Onstage"
Matt Walters (Zeppo), Matt Roper (Chico), Noah Diamond (Groucho), and Seth Shelden (Harpo) in I'll Say She Is. Photo by Mark X. Hopkins. I smear it on my face. I want it to be sweet . . ."
Photo: Director Amanda Sisk, with Matt Roper (Chico) and Seth Shelden (Harpo), backstage at the Connelly Theater during the 2016 Off Broadway run of I'll Say She Is. Dressing room mirror selfie by N.D.